Happy Tasty Tuesday! Since it's November, I thought it would be fun to dedicate this month to Thanksgiving treats. Today I'll be starting with my favorite food category- dips. I don't know about you, but dips are my absolute favorite part of any big meal. I could make an entire meal out of them! 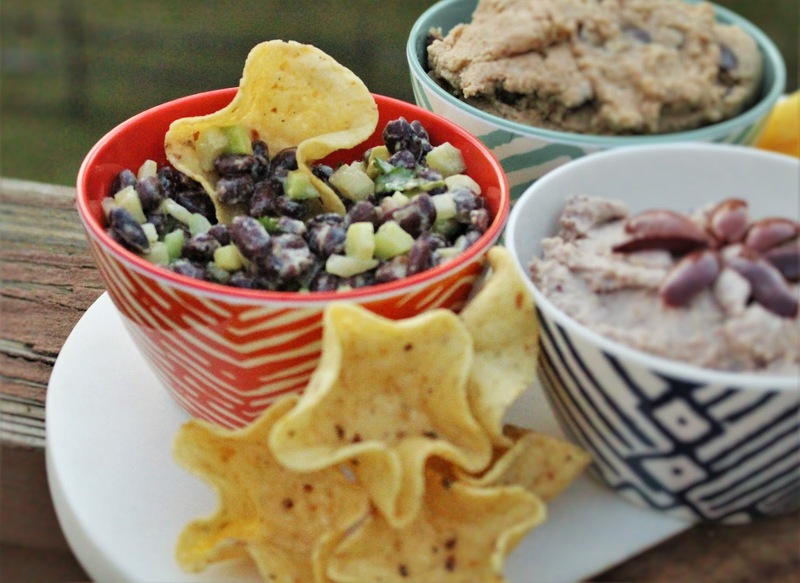 I'll be sharing four different dips- two sweet ones and two savory. Best of all- they're all vegan! Cream together butter and sugar. Stir in vanilla and milk, then slowly mix in flour and salt. Once everything is combined, stir in chocolate chips. This is also great with any kind of mix-ins- toffee chips, peanut butter, or oreos! Blend all ingredients in a blender and serve. 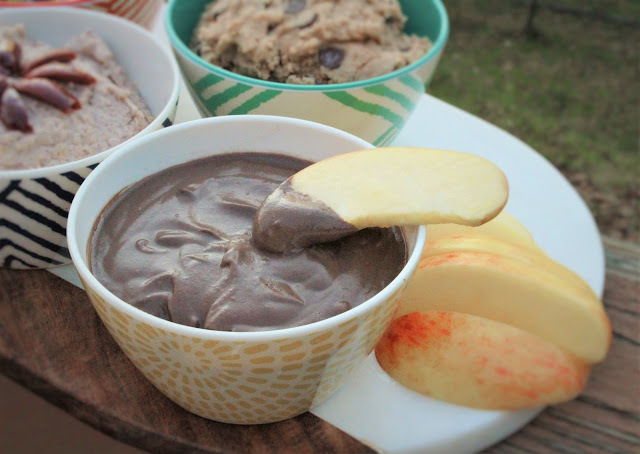 Not only is this great as a dip, but it also works as a vegan pudding! Blend all ingredients in a food processor. Add one tablespoon of water at a time until smooth. Garnish with more olives, sliced up. If you don't like olives, feel free to substitute roasted peppers, sundried tomatoes or cilantro. Mix together beans, celery and onion. In a small bowl, whisk together remaining ingredients very well. Pour dressing into bean bowl and mix. What's your favorite part of holiday meals? A spoon would be necessary here. I have dipping issues. As in, I don't like to share. o0o0o these look great! 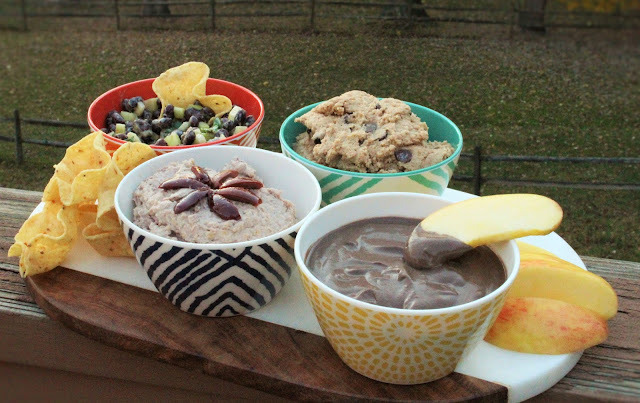 I usually prefer savory for dips but I could definitely get down with those sweet dips for dessert! I'm team savory, but also team "I'll take dip any way I can get it". I see all those cookie dough recipes & always mean to try them. But I'm lazy, so I just buy break & bake and eat it raw. And think of it like boosting my immune system. Hahaha. I love spinach artichoke dip, or my Mom makes something called Cowboy Caviar, with black beans, black eyed peas, celery, corn, tomatoes & bell peppers all with a vinaigrette type dressing on top. SO GOOD. Best thing about vegan recipes- no raw egg so you can eat all the dough without fear! 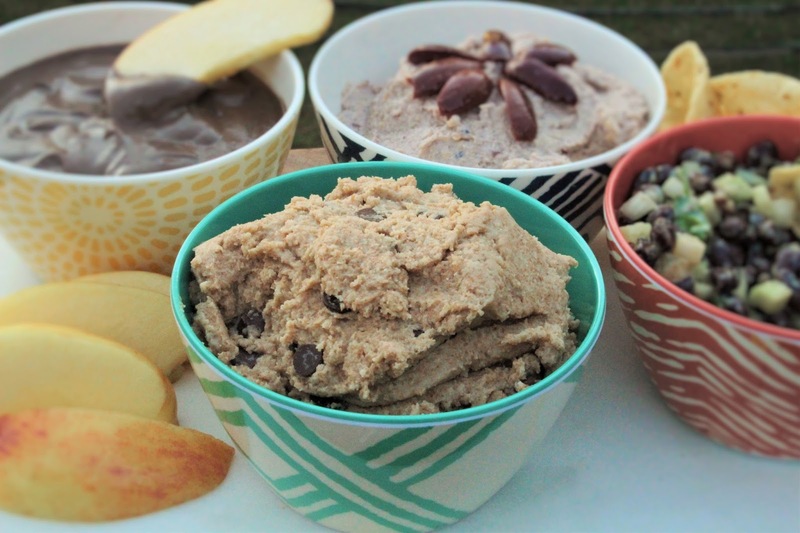 love the cookie dough dip! I have made one using chick peas before. I've seen so many recipes for that but I'm afraid to try it! When I dip, you dip I dip (it's a line from an old song). I AM ALL ABOUT THE DIP. I dip dip into dip. 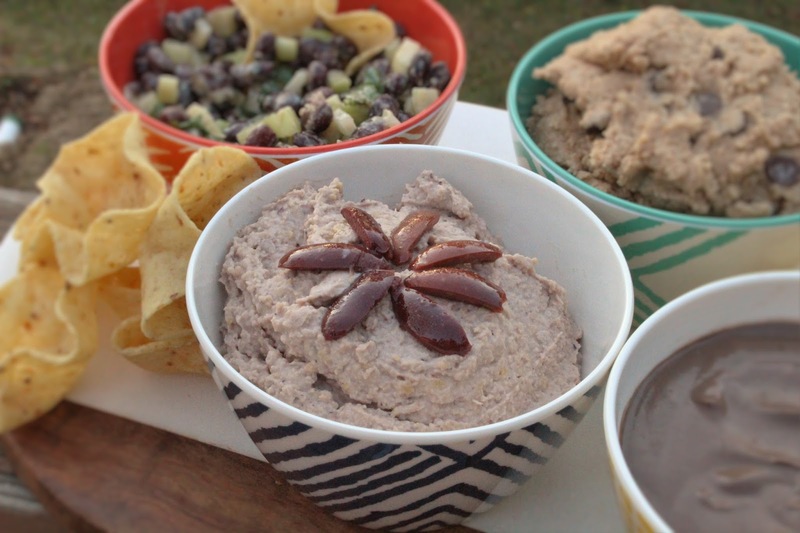 The blank bean dip looks great! Gotta try that. NO LIE I sang that song the entire time I wrote this post! mmmm these all look so good! i am probably more savoury when it comes to dips. the black bean one looks so good! alll of these look super yummy and would make a great addition to the table! i'm quite partial to the black bean one! 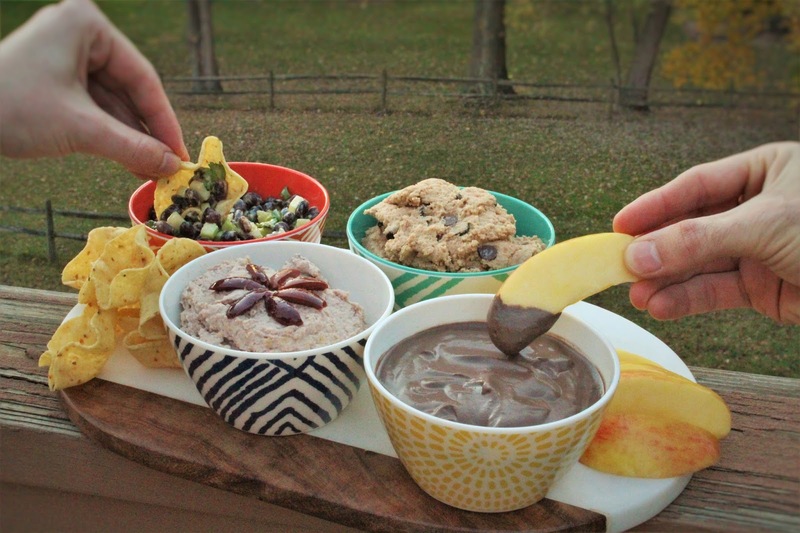 I love dips-- but usually the ones that are full of cream cheese and super unhealthy, so these are such good ideas! Definitely trying out the black bean one!